FORD F-150 SAFETS TRUCK. 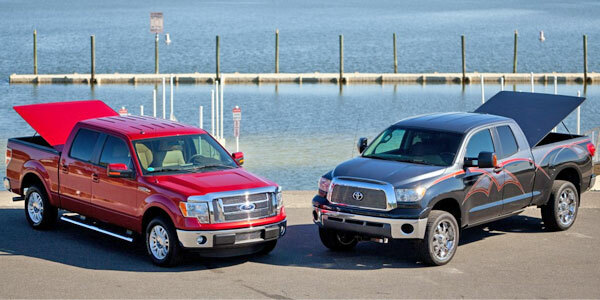 The Ford F-150 and the Toyota Tundra, also scored the "Best Safety Pick 2011" in frontal crash tests, side and rear. WASHINGTON — The Ford F-150 and the Toyota Tundra were the only two pickup trucks of 2011 that successfully passed the rollover protection test made by the Insurance Institute for Highway Safety (IIHS). The IIHS said that the Nissan Titan obtained an "acceptable" result, while the Chevrolet Silverado and the GMC Sierra, from General Motors, and the Chrysler's Dodge Ram, got bad scores on the same tests. The Ford F-150, the best-selling pickup in America, and the Toyota Tundra, also scored the "Best Safety Pick 2011" as they got the best results in frontal, side and rear crash tests, and have stability control electronic systems. In the IIHS rollover tests, an independent organization formed by insurance companies, a metal plate is constantly pressed against one of the corners of the roof. To determine the ratio between strength and weight, the vehicle's weight is compared with maximum strength sustained by the roof until it produces a flattening of about five inches. According to the IIHS, the roof of the Toyota Tundra resisted a similar strength to 4.5 times its weight while the Ford F-150 withstood a rate of 4.7 times. The institute gave a rating of "good", which is the best it gives, if the strength-weight ratio is greater than four. In comparison, the Nissan Titan was rated as acceptable as its proportion was of only 3.56. The Chevrolet Silverado and the GMC Sierra got a ratio of 3.13. In the last position of these test, was the Dodge Ram 1500 with a score of 2.97. The Ford F-150 got the best possible score in the IIHS dump crash test, after making modifications to the roof of the vehicle for the 2011 model.